1. Two mission-critical elements you’re missing. with key ingredients you can’t afford to ignore. 2. A way to give yourself an edge. how to kick it up a notch. Differentiate yourself. Make them want you. Permanently. 3. Plan your journey to accomplish your goal. 4. Five rules for reeling them in. Every man and woman has certain hard-wired behavior patterns. out the door. We spell them out for you. 5. Tips on how to make yourself a “must have”. boring ingrained routine – away. 6. Blog updates to keep you pumping out passion. helping you weather the crises and excel in the opportunities. 7. The keys to unleash your creativity. 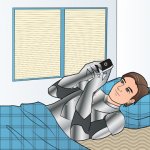 to help you become a better texter, and a better catch. The art of conversation is complex, powerful, and deeply personal. While it takes time to learn how to carry on a conversation with ease, it’s definitely a skill worth having. After all it is conversations that bring people together. So, if you want to learn how to talk to others like a pro, read on for some great tips and tricks that will turn you into a master conversationalist in no time flat. Do you ever find yourself wondering how to carry on a conversation? Do others seem to be able to talk to people they’ve just met with ease, while you struggle to keep people interested in what you have to say? If so, don’t worry. People may not always admit it, but the truth of the matter is that carrying on a conversation is hard. Being able to talk to people you don’t know very well or to talk to anyone for an extended period of time takes practice and skill. While some seem naturally gifted at conversation, others feel uncomfortable talking to others (especially those they’ve just met). Luckily, it doesn’t have to be this way. Really! With the right tips and a bit of practice, just about anyone can master the complex art of conversation. Almost nothing kills a conversation quicker than dead air. Awkward silences happen for a wide variety of reasons. Whether they arise because you ask the wrong questions, because your conversation partner wasn’t paying attention, or because both parties simply can’t think of anything to say, awkward silences make people feel uncomfortable which discourages them from being open and sociable. And while everyone is bound to experience awkward silences and pauses eventually, there are ways to reduce their frequency. For instance, one great way to keep a conversation flowing is to avoid bringing up more typical “small talk” topics at the beginning of the conversation. These topics tend to be things about work, the weather, and current events. In many conversations, people expect to be asked what they do for a living, or what they think about the big movie that everyone went to see. There’s nothing wrong with small-talk, but you should consider them to be your back-up topics, not your go-to starters. So next time you find yourself in conversation, hold off on asking someone about such commonplace topics until you sense a lull or an awkward silence creeping up on you. Then, you can avoid dead air without saying something ridiculous or being forced to come up with an original topic under pressure. One of the most important things to master when learning how to carry on a conversation is the art of questioning. Conversations are often built on questions. Avoid asking yes/no questions at all costs. Such questions don’t encourage a person to elaborate or to share much about themselves (think of them as the dead-end streets of conversation-town). “How” and “why” questions are the best for getting people to talk freely and for learning the most you can about them. If a “how” or “why” question doesn’t seem natural, try a “what,” “where,” or a “who” one instead. Then, if you can, follow it up with one beginning with “how” or “why”; such follow-up questions are a great way to keep a conversation moving while showing someone that you are paying attention to what he or she is saying. Also, try not to ask questions about subjects that are likely to make someone uncomfortable. If you’ve just met, or suspect that their views might differ from yours, don’t ask about religion, politics, or anything else “touchy”. The last thing you want is for a conversation to end on a negative note. If people want to share that type of information, allow them to do so in their own time. • You seem really passionate about your career, how did you figure out it was the right one for you? • What’s your favorite place to unwind? Why? • Is there anything you’ve always wanted to do? What’s on your bucket list? • Who or what inspires you? What is it that you admire most about them/it most? • What’s one thing you couldn’t live without? • Is there one book you could read over and over again and never get tired of? What is it about it that makes it so special? • What do you think is the secret to being successful? • What would be your perfect day? • What types of sports do you like? Are you an outdoors person? Personal anecdotes are a great way to show someone that you aren’t afraid to open up to them, but not every story is conversation-worthy, especially if the person you are talking to doesn’t know you on a particularly intimate level yet. Try to make sure that any anecdotes you share are relevant to the conversation you are having. You don’t want to interrupt the flow of a lively conversation by telling random a story that catches the other person off guard. Also, try to choose anecdotes that portray you positively. An amusing or touching anecdote is great, but choosing one that showcases your best qualities is even better! No matter what anecdote or story you choose to tell, make it short. You don’t want to give the impression that you are self-absorbed. After all, while every detail of what happened last Tuesday may be interesting to you, the person you are talking to will appreciate it if you get to the point in a timely fashion and allow them to respond regularly. No matter how amusing the story, no one likes to listen to one that drags on forever. Most people have limited attention spans. One of the best ways to improve your conversation skills is to master the art of listening. So, it probably comes as no surprise that learning how to carry on a conversation like a rock star requires being a good listener. Listening well shows people that you are interested in them and that you value what they have to say. Maintaining eye contact is a fantastic way to show people that you listening, but there are others as well. For instance, make sure that you answer any questions you are asked appropriately. Similarly, ask follow-up questions that demonstrate you fully understand what a person has said to you. Beyond merely hearing what someone says to you, pay attention to a person’s tone, mood, and demeanor. If someone’s eyes light up when you ask them a certain question, or if they just can’t stop smiling when discussing a specific topic, don’t be too quick to change the subject. Similarly, is someone seems to tense up at a certain point in a conversation, that may just be your cue to steer things in another direction. These may seem like little details, but it’s super important to keep them in mind when trying to master how to carry on a conversation (without looking like an idiot!). And, whatever you do, don’t take out your phone, check your watch, or interrupt someone while you are having a conversation (sorry, no texting). Any of these actions will make the other person think that you are disrespectful or that you don’t really care about what they have to say. At the end of the day, the best way to carry on a rewarding conversation is to be as sincere and as relaxed as possible. Try your best to remain polite and to show interest in the other person, while being open and genuine, and you shouldn’t have too much to worry about. Next time you talking to someone, give a few of these ideas a go. And remember, as with any skill, learning how to carry on a conversation takes practice—so don’t give up – keep talking! Sign up now for our 30 day Free teeing Club Trial and you’ll receive over 300 messages!  Claudia Cox is a modern communication expert who gives singles and couples alike the tools they need to improve their relationships. She is the creator of The Text Weapon Texting Club, and the author of French Seduction Made Easy. She loves the outdoors, baking tasty treats for friends, and of course, texting. If you’d like a picture to show up by your name, get a Gravatar. Enter your email address and get my ULTIMATE TEXTING TIPS for FREE! Simple advice for single or coupled-up guys and gals. Inject passion into your texts now! © Copyright 2019 Text Weapon. All Rights Reserved. Want Free Quick and Dirty Texting Tips ? Spice up your text life!